This passage tells us that we can know God's good, pleasing, and perfect will; and that the starting point for knowing God's will is submitting our will to his will. As we offer ourselves to God we worship him and renew our minds in him. Our will is transformed into his will as we love God and seek to follow him. This is not a one time thing but, rather, a life-long process of walking with God, reading the Bible, and seeking to conform our will to his. Bruce Waltke wrote a book entitled, Finding the Will of God: A Pagan Notion?1. In it he speaks of how people will cast lots, look for signs, open the Bible to a random verse for guidance, or "lay out a fleece." He suggests that many of these ways we seek to hear from God have more in common with paganism than a biblical Christian faith. Waltke reminds us that there is no substitute for the long steady process of a close walk with Jesus. We cannot short-circuit God's guidance in our lives. Many of us have had the experience of hearing someone say, "God told me to . . ." We may sometimes find ourselves wanting to ask that person, "How did God reveal this to you?" We question whether it has more to do with what God wants or with what that person wants. Whose will are we dealing with here? When someone says, "God told me," it can be hard to argue with them. So, how can we know the will of God? How can we expect to be guided by God? 1. God's word - the Bible - would the Bible back this choice? 3. God's reasons - God usually guides us through common sense and logic. Psalm 32:9 says, "Do not be like the horse or the mule, which have no understanding. . . ."
4. God's people - we talk to others and confirm that we are hearing rightly from God. Proverbs 12:15 says, "The way of fools seems right to them, but the wise listen to advice;" and Proverbs 15:22 says, "Plans fail for lack of counsel, but with many advisers they succeed." 5. God's signs - circumstances of life. Proverbs 16:9 says, "In their hearts humans plan their course, but the Lord establishes their steps." Number two in this list is likely the most difficult. God's word tells us that he has placed his Spirit inside of those who follow Jesus (see for example 2 Timothy 1:14) and that we are to keep in step with this Spirit that lives in us (Galatians 5:25; Romans 8:4; Romans 8:26). The thing we must work at is getting good at discerning the voice of the Spirit who lives inside of us and distinguishing that voice from all of the other voices we may hear in our heads. This takes years of practise, patience, and learning. Number four reminds us that we have been given the people of God, the Body of Christ as one part of how God speaks to us. When we think that we are hearing from God we should speak with trusted friends inside the Body of Christ and ask them if they think that we are hearing accurately. If God can speak to us, he can certainly speak to others as well and help to confirm what we are hearing. This also means that we need to be in relationship with the people of God. We must constantly be cultivating our relationships with others in the Body of Christ. Numbers three and five are similar but three emphasises that God has given us a good brain with which to think. He wants us to use it. Number five is about paying attention to circumstances of life. If I head in a certain direction, do doors open or close. Even then it may take logic and discernment to determine which doors are closed and which might need a bit stronger push. These five principles are helpful; and, again, we must remind ourselves that all of this starts with us being in right relationship with God. If we submit ourselves to his will and trust him to lead us toward fulfilling his will in the world, we will be at the place where God can use us and direct us toward his specific will for our lives. 1 Waltke, Bruce K. Finding the Will of God: a pagan notion? Grand Rapids: Wm. B. Eerdmans Publishing Company, 2002. This picture brings to mind many science fiction stories and songs I have read and sung. I used to dream about being an astronaut and traveling to the far reaches of our solar system, then striking out for uncharted space. This is the kind of vision I would have when I imagined exploring the galaxy in a space vehicle. I can almost feel the immense loneliness of looking back at a planet containing everyone I know, and eight billion other humans. 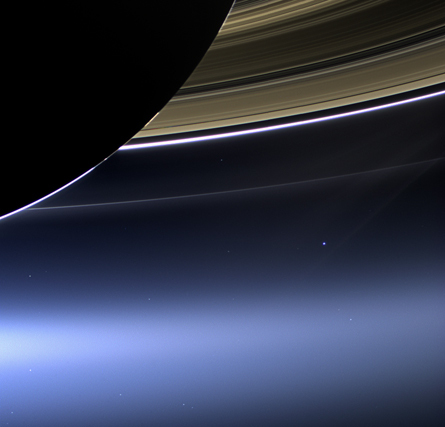 The truth is, this picture was taken by a camera on board a man-made vehicle in orbit around the planet Saturn. The photo shows Saturn, the rings of Saturn, and Earth as a tiny blue dot just to the right of centre in the picture (the bright one). It was taken by the Cassini probe built by NASA and sent to a distance of 1.4 billion km from earth. This is of course still within our solar system; yet, it is hard to imagine distances larger than this. Elton John sang about the loneliness of space in the song Rocket Man. I wonder what he would think of the photo. Sandra McCracken and Derek Webb released a short collection of songs (EP) called TN & EP. On that EP is a marvelous song called "Tennessee" (listen to it here). I could not find the lyrics anywhere on the web so I transcribed them myself and checked with McCracken's staff to confirm a line or two. Here are those beautiful words. Enjoy this tribute to Scottish roots and the music of Tennessee. I have been reading Leading from the Second Chair1 by Mike Bonem and Roger Patterson. The book is designed primarily for those who will lead in a church context as executive pastors; yet, the insights within the book are valuable for anyone who leads or serves in any organization. This post will not be a review of the book but rather a description of concepts which I have found helpful. The main premise of the book is that second chair leaders live within three apparent paradoxes: subordinate-leader, deep-wide, and contentment-dreaming. They suggest that a great second chair leader will get good at both ends of each continuum and will live within the tension of the two extremes. They say that the greatest second chair leader of the Bible was Joseph, in Genesis 37-47, who rose to be second in command of all of Egypt by living within these paradoxes. The essence of the task is that of servant-leadership. They compare it to waiting tables. Bonem and Patterson quote J. Oswald Sanders who said, "The spiritual leader of today is the one who gladly works as an assistant and associate, humbly helping another achieve great things. "3 That could be the goal of every coach, manager, and leader. We serve by helping others to become all that God is calling them to be. The book emphasises that good leaders are good followers. "If a leader can't be a follower, he can't be an effective leader. . . [and] Great leaders are ultimately great followers. "4 The authors make the point that great leaders create space for others to become leaders.5 As leaders, we must not feel threatened when others become greater and we become lesser. They ask an important question that gets to the heart of our working relationships: "Would I rather have the right answer or the right relationship? "6 The answer to the question will not always be simple but it is always the right question to ask and the bias must always be toward relationship whenever possible. Toward the end of the book they go on to speak of dreams. They ask a series of questions. In coaching others, I have often queried my clients with the similar question, "What is it that God is calling you toward?" These questions are important questions to ask ourselves as we serve and lead others. Whether or not you take the time to read this book, I hope that you might at least pause to ask yourself a few of these questions so that your life of service may be in greater focus. 1 Bonem, Mike, and Roger Patterson. Leading from the Second Chair. San Francisco: Jossey-Bass, 2005. I am intrigued by tidal waters. Tidal flow has a remarkable predictability and, at one and the same time, a high degree of irregularity. The movement of the fluids of the earth are affected by a number of factors. If we focus only on the oceans for a while we can make a case for the rise and fall of these waters that is largely affected by gravitational forces exerted by the Moon, the Sun, and the rotation of the Earth; and by the three-dimensional shape of the basins in which the water resides. Of these influences, the most influential would be the moon. The moon exerts a tremendous gravitational force upon the whole planet. Its effects are felt by the earth's crust, which rises and falls a few millimetres with the passing of the moon overhead, and the earth's atmosphere which rises and falls many metres via the same influence. The moon also affects our bodies as they are unconsciously pulled toward the moon adding to and reducing our weight, pulling body fluids such as blood and amniotic fluids in the same direction as tidal waters. It is no coincidence that an average for women's menstrual cycles is 28 days (varying greatly from woman to woman) while the period of the moon's orbit is 27.3 days and a complete cycle of the moon's phases takes 29.5 days. There is not sufficient space in this article to explain the ways in which these last two numbers are measured. Perhaps a later blog will delve deeper into the movement of the moon around our planet. Indeed I may one day reward faithful readers with the answer to a physics question posed several months ago. But all of that is an aside to the point at hand: the moon also tugs at the oceans of our world. If you have never done it, I strongly encourage you to spend some time at a tidal portion of the ocean and pay attention to the rise and fall of sea level. If you can, track the position of the moon while watching such things as currents in the water, depths of the water, and the movement of anchored boats in a harbour. Many people have lived beside the sea for years without taking the time to observe the tide. Some are not even aware that water levels rise and fall with a regular rhythm. In many locations, including False Creek, the portion of sea by which I live, water levels rise to a high tide approximately twice a day, and sink to a low tide approximately twice a day. It is important to say "approximately" because the other factors associated with tides have their effect and contribute to what looks like irregularity in this system. The combined effect of the gravitational pull of the sun and the moon is one of the other factors contributing to our ability to accurately predict sea levels at any given place in the world. Here is a tide chart for Vancouver tidal waters. Tide charts such as this are a good general predictor but even they will not completely reflect sea levels at a specific beach or point along that beach. Tide charts always come with warnings. I can't help but reflect upon the wisdom of a Creator who designed the planets, moon, and stars in such perfect equilibrium. The gravitational effect of the moon is substantial enough to move the seas, yet small enough to leave the crust of the earth intact even after many centuries of tug and turn. In some places waves rush upon the shore and crash to great effect. In other places the ripples of water are gentle and leave the seashore less eroded. What a wonderful, rugged, changeable planet and universe we have. My heart will praise the God who formed it all with his great creativity. Richard Dawkins wrote The Selfish Gene in 1976. It represented some of his greatest writing and was much less antagonistic toward other philosophical and theological perspectives than his later writings. The book described a gene-centred view of evolution and was not a treatise on whether or not organisms are selfish. Yet, a persistent problem in the genetics of evolution has been the concept of cooperative behaviour. Social insects such as ants and honey bees have often perplexed researchers and evolutionary theorists. If the primary goal of an organism is to see that more of its genes are passed to the next generation than the genes of competing organisms, how do we explain social behaviour? As one journal article asks, "In what way can the self-sacrificing sterile ant be considered to 'struggle for existence' or to endeavor to maximize the number of its descendants? "1 One way around the problem of cooperation in the social insects is to view the entire colony as a single organism. This allows us to explain the entity with the common models of evolutionary research. But what about cooperation between species? Ecological scientists studying the behaviours of coyotes and badgers in the National Elk Refuge in Wyoming have noted that badgers and coyotes collaborate to catch burrowing rodents such as Richardson's Ground Squirrels (commonly known as gophers).2 On the surface, this cooperation might look like altruism; yet a closer look reveals why the two species work together. Badgers dig after gophers and pursue them underground while coyotes chase them above ground. The researchers noted that "coyotes, which are faster and have a larger range, would scout, and once they spotted a [gopher], they would signal to the badgers. "3 Then, if the gopher escaped underground, the badger would dig and corner it in a burrow. If the gopher stayed above ground, the coyote (or in some cases, coyotes) would give chase and run it down. The ecologists said the data suggested that coyotes hunting with badgers caught 34% more gophers. Since the badgers caught and ate their prey underground they could not confirm an advantage for the badgers who worked with coyotes; but, intuitively, it would make sense that they too benefitted from the cooperation. This an example of something that looks like altruism that can be explained by typical concepts of survival of the fittest? A more fit coyote is a coyote that can work out how to cooperate with a badger? The study is all the more interesting because, given the chance, a coyote will eat a badger and a badger will eat a coyote pup that it corners in a den. In the polarizing discussions of evolutionary theories versus non-evolutionary theories of creation, such cooperative systems have been used to suggest that there are deficiencies in the evolutionary explanations. Yet, we must not be quick to use a particular system as a proof for our point. We must carefully observe data, draw tentative conclusions, and then move on to greater research. The integrity of science, theology, and philosophy requires honesty and transparency at all levels. 1 Hamilton, W. D. "Altruism and Related Phenomena, Mostly in Social Insects." Annual Review of Ecology and Systematics 3 (1972): 193-232. Haemig, P.D. "Badger-Coyote Associations." Ecology, 2012: Info 11. Hamilton, W. D. "Altruism and Related Phenomena, Mostly in Social Insects." Annual Review of Ecology and Systematics 3 (1972): 193-232. In February of 2011 I posted the lyrics of a song by Alan Root. I could not find the lyrics that our daughters and I used to listen to on the cassette we borrowed from the library. Alan Root has since re-written the song and made it more academic and less fun, and those rewritten lyrics were the only ones I could find. One of our daughters remembered most of the lyrics with only one incomplete line. Now thanks to an anonymous reader we have pieced together the original lyrics. I will publish them here for all to enjoy. Perhaps one day someone will find a recording of the original song and post it on YouTube or some such site. I still think the song can be a great discussion starter for how we understand the creation of the universe. Contrary to what the song says, it is unnecessary to make a choice between science and faith. God is big enough to create a universe in which science explains his creative process. So, feel free to engage the discussion and enjoy the humour of this song. Don't laugh at these men they claim back then the seas were full of this protein gloop. And it became DNA, so the scientists say, when the sun hit the soup and it cooked. Then fishes, then birds, then us, my word! This is written in most of our books. But you cannot make a chicken from soup! Well not monkeys but apes, what a difference it makes, when you're preaching and teaching what you really don't know. Suddenly a thought hits you right in your head, "How does Darwin do what he do?" It takes more resolution to believe in evolution than the seven day story that's true. In seeking God as the 'one thing necessary' our continuing quest for a 'new monasticism' is the heart of our life whether alone or together. It is this blending of 'a prayer that is quiet and contemplative and a faith that is active and contagious', lived out in the ordinariness of everyday life, which forms a foundational basis for our growth and development. I often speak of the degree to which I appreciate Celtic expressions of the Christian faith and I find myself drawn to the prayers of this branch of the Christian faith. Northumbria, in particular, has a rich history of prayers and blessings which anyone can use in drawing close to God each day. I encourage readers to explore the prayers of this community of people who are seeking to draw close to God and live out an active, missional, faith. I will leave you with two prayers that I have found helpful in the last few days. I went to see Man of Steel yesterday and I found myself comparing it to The Dark Knight Rises. Both Superman and Batman are characters that originated in comic books so one would expect the stories to be equally over the top with comic book violence and destruction. Yet, somehow, The Dark Knight Rises comes across as more real. Perhaps it is that Batman is just a wealthy man making the most of fitness and technology while Superman is an alien with god-like powers. Both movies have contributions from Christopher Nolan. Man of Steel features Nolan as a co-writer of the story while The Dark Knight Rises screenplay was written by Christopher Nolan and Jonathan Nolan and the movie was directed by Christopher Nolan. Christopher Nolan's directing is more subdued than the directing of Zack Snyder in Man of Steel. Snyder goes overboard with the violent destruction of Metropolis - building after building is destroyed and tips over on people below. He seems to want to make use of as much computer generated animation (CGA) as possible. Nolan, on the other hand, uses his fair share of CGA but limits the destruction of Gotham to a level that could be caused by over-zealous criminal master-minds rather than that caused by two gods wrestling throughout a vast cityscape. I think that movie audiences will soon tire of watching fight scenes of the calibre found in Man of Steel. How many times can we watch Superman get punched through a building or see the villain get knocked clear into earth orbit and take out a geostationary satellite before we tire of such over the top ruin and simply find it boring? I found myself waiting for the fight scenes to end so we could get on with the story. There is another level at which to compare the two movies. I have previously written about the theme of self-sacrifice in The Dark Knight Rises and the theme is again present in Man of Steel. At one point we see a submissive Superman being led in handcuffs by a team of soldiers. The audience knows full well that the puny handcuffs will not hold him and sure enough we later see them pop off with no effort at all. Superman is seen as a potential danger to the humans of earth. Superman responds to this by saying that he has been around for 33 years and has not harmed anyone yet. In both these words and the scene with the soldiers there are definite allusions to the Christ story of the Bible. Just as Jesus was led away (at about 33 years of age) by a group of soldiers who could have been felled by a single word from his mouth, Superman submits to these humans who truly have no power over him. Superman is willing to sacrifice himself and be turned over to General Zod from Krypton to save the lives of the people of earth. Yet the theme is not developed as well as it was in The Dark Knight Rises and does not have the same emotional tug. Perhaps the Batman story is simply a better story with which to work as compared to the Superman story. Batman is everyman. His struggles and his weaknesses are common to humanity. Man of Steel tries to play upon the foreigner in a strange land aspect of Superman but the reality is that Superman is still a Kansas farm boy with good old American values. He also has god-like powers and very few weaknesses. Batman is someone with whom we can relate; but how can we truly relate to this super man?